The history of Fruitland Baptist Church started over 130 years ago. This took place in 1875, when a group of people decided there needed to be a Baptist church in this area. Green Mountain Baptist Church was then established, and Rev. B.M. Taylor served as pastor. Years later, it was decided to move the location of the church and it was then re-named Fruitland Baptist Church. Land was exchanged with Fruitland Baptist Bible Institute, where the church stands today. Later Rev. N.A. Melton and the State Mission Board gave more land, totaling 2 1/4 acres. Until the 1940ˆs church services were held in the Fruitland Institute building. 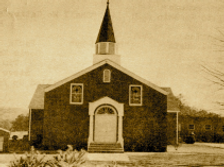 The members decided to build a new church and construction began; with the first service being held in May, 1947. Over the years, additions have been made and a parsonage was built. The Luke Sinclair and Manuel Pressley, Sr. families gave the land, known as the Evans property, for the parsonage. Construction of the Melton Education Building was started in 1959. In 1964, it was dedicated and named for Rev. N.A. Melton. Rev. Melton served at Fruitland for fifty years. The church purchased the Marvin Melton property in 1965. Dewey Hobbs and Raymond Moore donated other lots to the church. As our church has grown, many pastors have served: the Rev. N.A. Melton 1909-1957; Dr. Charles Stanley, 1957-1959; Rev. Richard Davis, 1960-1964; Rev. Bobby Graham, 1964-1971; Rev. Lamar Wakefield, 1973-1977; Dr. Larry Patton, 1977-1981, Rev. Walton Marsh, 1982-1987; Rev. Harold McKinnish, 1988-1990; Dr. Michael Smith, 1991-2016 and current pastor Rev. Craig Stepp, 2017.